"...excellent musicianship... a good place to look to when you have the need to produce or compose in a traditional jazz style." Enjoy a slick ride with the fully equipped Jazz City. 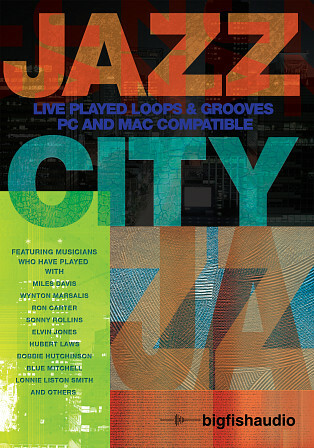 Inspired by the classic 1950s and 1960s jazz albums of artists like John Coltrane, Miles Davis, Herbie Hancock, and others, Jazz City features 14 huge construction kits of traditional Jazz loops. Also included is a substantial amount of extras and alternate loops, bringing the total content to nearly 3 GB in just the WAV format! An array of different ensembles are included, ranging from intimate-sounding jazz trios to quartets, quintets, and smokin' sextets. The trumpets are soaring, the saxophones are sultry, the basses are thunderous and the piano is powerful. With a wide variety of key signatures and tempos ranging from 55 to 205 BPM, Jazz City will keep your feet movin' and your productions groovin'. 14 Construction Kits (1.6 GB of WAV files). 1.4 GB of extra and alternative WAV file loops. The Following End User License Agreement is included with Jazz City. 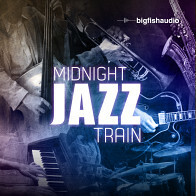 This License is only valid for the individual who has purchased an unopened, new and lawfully made copy of Jazz City from a dealer or distributor authorized by Big Fish Audio. "The samples contained herein are licensed, not sold to you, the individual end user, by Funk/Soul Productions.This non-exclusive, non-transferable license is granted only to the individual end user who has purchased an unopened, new and lawfully made copy of this product from a dealer or distributor authorized by Big Fish Audio. All samples remain the property of Funk/Soul Productions and are licensed only for use in the creation of a live or recorded performance that includes the licensed samples as part of a derivative musical work created by the licensed end user. This license expressly forbids resale, rental, loan, gift or transfer of these samples in any format or via any medium, except as part of a derivative musical work. PLEASE NOTE: The samples may not be included, whether unmodified or as part of a derivative work, in any music library or sample library product. Any unlicensed usage will be prosecuted to the maximum extent possible under the law."